This is the ultimate mac and cheese. 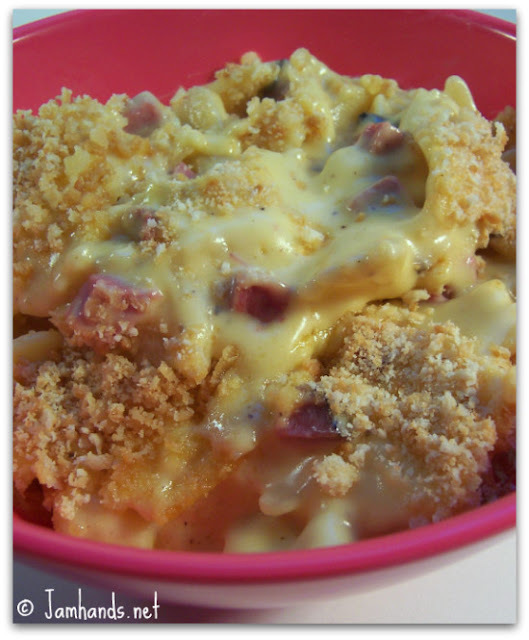 It has a delicious twist with some little chunks of pastrami thrown in, then it is topped with some buttery bread crumbs. Delicious. 1. Preheat oven to 350-f degrees. Butter an 8 x 8-inch baking dish. 2. Bring a large pot of salted water to a boil over high heat and cook the farfalle until al dente, 8 to 10 minutes. Drain. 3. In a large saucepan over medium-low heat, melt the 4 Tbsp. butter. Sprinkle the flour and stir with a wooden spoon until the flour is incorporated, about 1 minute. Gradually add the milk, stirring, and raise the heat to medium. Cook, stirring frequently, until almost boiling and smooth, about 5 minutes. Add the cheeses and stir until melted and incorporated, 2 to 3 minutes. Stir in the pastrami and lower the heat. Add the pasta and season with salt and pepper. 4. Transfer the pasta to the baking dish and top with the cracker crumbs. Bake until browned and bubbling, 20 to 25 minutes. I am still here and thinking of you - Lana has had me so busy that I think I will stay in bed for the entire first day that she goes back to school! AND she is using everything that you gave her including the big Pooh box. Enjoy your last month as a couple and as the only girl because motherhood is tough! I'm adding this to next week's menu. Look yummy and I'm sure that my whole family will love it.